June & Sunny's Fall Capsule Wardrobes — walk in love. A few months ago I found myself spending more time than necessary thinking about what my girls should wear when getting them dressed for the day. Maybe you can relate to my inner dialogue that went something like this "Ahh crap, these don't fit Sunny anymore. Why doesn't June own a single long sleeved item!? Well, she can't wear this cause I have nothing to go underneath it. Why haven't I put all of these newborn winter clothes away? Why does June only have one pair of sandals when she can't even put them on herself!? Note to self: stop buying pink shirts AND pink pants. Nothing goes together!!!" To make matters worse, I also haven't been taking the time to remove the items that don't fit or are the wrong season, and it's left me with a false sense of clothing that actually does fit. 😂"Oh what this 2T snowsuit won't work for our summer vacay? Weird!?!" And after thinking those things for a few weeks in a row, I decided to finally give this whole capsule wardrobe thing a shot. I have thought about doing a capsule wardrobe for June for at least two years now. In fact, I've always wanted to do one for myself, but haven't gotten around to it yet. And like most things in life, once you become a parent, you tend to do the thing for your kids before yourself. Goals: cut down on laundry, live a little simpler, and buy better things. Keeping in mind that better doesn't necessarily mean more expensive things, but just better -- for me and my family. 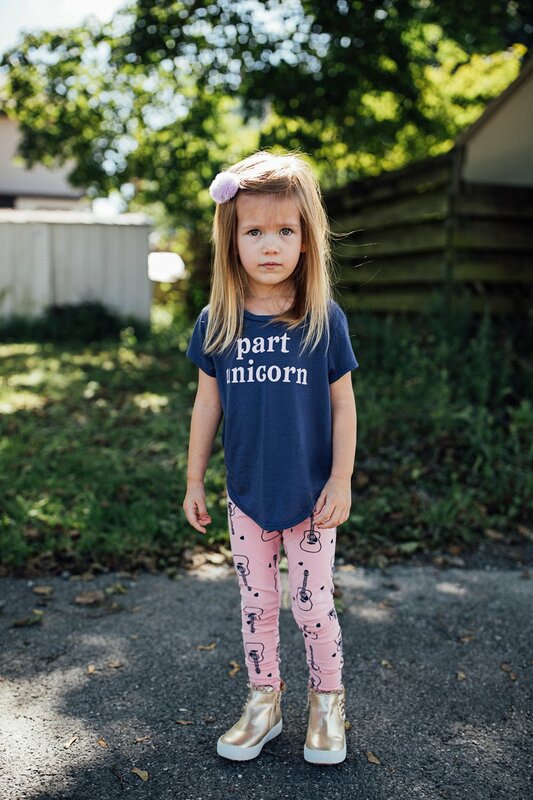 Plan: take the time to purchase clothes that I love for my girls and support small businesses when I can, and then have my kiddos wear these clothes --- day in and day out -- until they wear out. Technically a true capsule wardrobe has a very limited number of pieces that you wear year-round. But, with kids, who grow faster than the weeds overtaking my vegetable garden, I feel this rule can be bent a little bit because the pieces I have for my girls now honestly might not fit in six months! I have instead decided to follow some of the other tried and true rules of making a capsule wardrobe -- ie: have a limited number of pieces, choose a color scheme, choose classic shapes and patterns, and choose high-quality fabrics. As an avid Target shopper, I've fallen into the "let's just see what's new, or on clearance" and I pick up random items from time to time. And while they're a great price, or even really cute, there is no plan behind it. And so each season I'm left with a closet full of things that just don't quite work 100% of the time, or items are only worn once or twice, or never! Obviously, I'm not anti-Target! I've included Target items in this capsule, cause sometimes you just can't beat the price. My first step was to go through June's current clothes and pack away anything that was too small, out of season, or that we just won't be using the next few months. I kept 90% of the items that were too small for June so Sunny can wear them in a few years. And I packed away a small amount of Sunny's little clothes for future babies or for friends. *Side note: the only reason I am listing an end date of "December" is because I know both girls will get some new items for Christmas, and I'll want to add those into the mix with a fresh set of pieces for the new year. :) Obviously many of these items will still be wearable come that time! 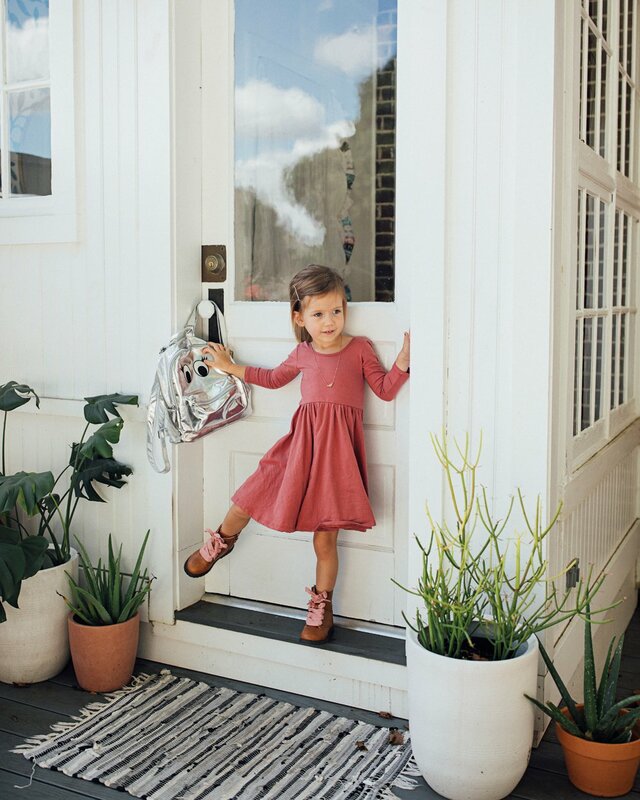 **Things you don't need to include in your final count, but should still be intentional about are pajamas, messy play clothes, and accessories like headbands or hats or backpacks. *Things you don't need to include in your final count, but should still be intentional about are pajamas, messy play clothes, accessories like headbands or hats. I would challenge you to give this a try. You might even be able to try this method without buying a single new thing. The point really is to simplify the getting dressed routine, have less laundry to do, have your kids really wear each item you've spent your hard earned money on, and to prove to yourself that you really can live with less. Just use what you've got, get creative, have fun with it, and enjoy the simplicity of it all.